Is Your Home An Easy Target For Burglars? Want to keep burglars away from your home? The majority of burglars like to do their research before breaking into a property – this could include scanning for weaknesses or checking which belonging are in sight. Here are several steps that you can take to stop your home being an easy target for these criminals. Many burglars will look out for signs of damage on doors and windows – these can often make easy entry points. Consider looking into services such as window glass replacement or door replacements if any of these are broken and currently boarded up. Also consider broken locks or weak hinges. Many modern doors have solid frames and robust locks that can’t be broken into easily. You can even consider reinforced glass on windows. 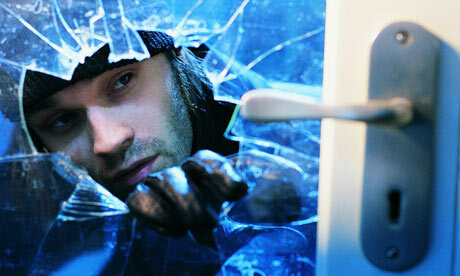 Burglars are more likely to try and break into your home if they can do it unseen. Adding exterior lighting to your home makes it much more difficult to a burglar to attempt a break in without being seen by a neighbour. Motion sensing lighting is often the best option – you won’t use up unnecessary energy keeping the light on throughout the night as it will only turn on when the movement of someone is detected. A high hedge in front of your home could also make it easy for a burglar to break in without being seen by neighbours. Consider cutting down any high walls or hedges that could be obstructing the front of your home. Taking down a high hedge could remove some of your privacy, but you can still stop potential burglars peeking in and looking at your possessions by drawing the curtains and blinds whenever you’re not it. Having net curtains permanently hung up over windows could allow you to see out whilst letting in the light, but could prevent burglars looking in – this could be particularly worth having if you live on a busy road in which many passers-by can peer in. A burglar alarm may seem like a drastic measure, but in certain neighbourhoods it can be handy to have. An alarm will notify neighbours but more importantly it may cause burglars to abandon their plans if they break into your door and an alarm sounds. You can buy alarm systems that link up to all your doors and windows. Some burglars won’t even attempt to break into your house – there may be some easy pickings in the garden. Expensive garden furniture, lawnmowers and gas/electric barbecues are some of the most popular items to steal. You can deter burglars by not having these items on display when you’re not using them. Covering them up could be enough, but you could make these belongings even more secure by locking them away in a shed. « How Energy Efficient Is Your Home?